Originally, this antique display case had a faux finish on it, a light wash with silver leaf. But when Bob Volk’s Bay Area company, El Shaddai Painting, remodeled the case owner’s home office, the case looked tired and washed out in its new surroundings. So the owner put the fate of the case in Volk’s capable hands. The room’s new wallpaper — sheets of Himalayan papyrus finished with hand-painted scrollwork and lots of gold leaf — gave Volk a long way to go before the case would stand out against such an ornate background. “I needed something very bold to work with the handmade paper and gold-leaf artistic scrolls,” he says. In the end, Volk decided the best way to make the case fit in with the wallpaper was to carry the key ingredient, gold leaf, into the new finish. Volk covered all of the silver leaf with gold leaf, adding more in areas that needed emphasis, like the crown molding on top. The gold leaf was then hand-rubbed to slightly age and distress it before the first glaze was applied. Volk started with a dark glaze to bring out all the edges and molding details. Then an umber glaze was brushed and worked over the whole cabinet. Finally, several coats of clear polyurethane were applied. Voila! 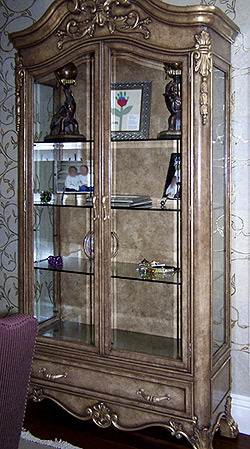 Volk’s client had a display case that fit perfectly into her luxurious new home office.